I was talking to a coworker the other day about all the slogans I'd like to just wear emblazoned on my chest. The only problem is that I don't want to just be wearing tee shirts all the time. 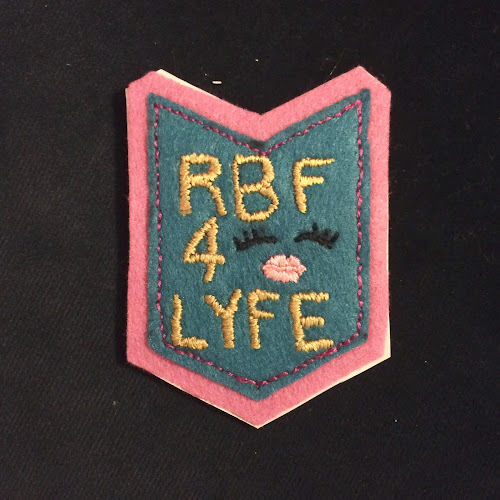 Then, she had the best idea ever: Iron-on patches. After Ivy suggested iron-on I seemed to see patches and pins everywhere. Miss Moss had an article recently about pins, Stylecaster had this article about wearing patches like a Street Style Star, and Ellen DeGeneres's new collection for Gap Kids has a two packs of really cool patches. I can't seem to find the non-alphabet ones online, though. I guess you have to get those in stores. 1. Chalk pencils don't really work on felt. I ended up having to use a Sharpie pen which created a little bit of a problem because then it needed to be covered up. I guess I should switch to the heat-dissolving markers. 3. I need to work on my lettering skills. I'm sure there will be lots more to learn as I make more. Be looking for at least a few patches at my tables at the upcoming craft fairs! Hopefully by then I'll have it down to a science. Happy Friday!